The islands of Rota, Saipan and Tinian, as well as nearby Guam, were in the path of Typhoon Mangkhut, which struck the islands Monday and Tuesday, according to U.S. Indo-Pacific Command. When the eye Mangkhut passed over Rota Monday night, the storm had sustained winds of 100 mph, according to the National Weather Service. Though the eye of the storm did not pass over Guam or the other islands in the Marianas, they still experienced hurricane-force winds. The storm has since intensified in strength, with sustained winds of 175 mph now as it heads toward the northern part of the island of Luzon in the Philippines, according to a National Weather Service report issued Wednesday morning. President Donald Trump declared a state of emergency for the U.S. Commonwealth of the Northern Marianas Islands (CNMI) on Monday and directed the Federal Emergency Management Agency (FEMA) to coordinate disaster relief efforts. FEMA is working with local authorities to determine how much damage Mangkhut caused to buildings and the islands’ infrastructure. The Wasp ESG has surveyed possible sites for its landing craft to operate at on Rota, Saipan and Tinian. MH-60S Sea Hawk helicopters and MV-22 Osprey tiltrotor aircraft were used to provide aerial views of landing site possibilities and to bring teams to shore to conduct ground surveys, according to U.S. 7th Fleet. 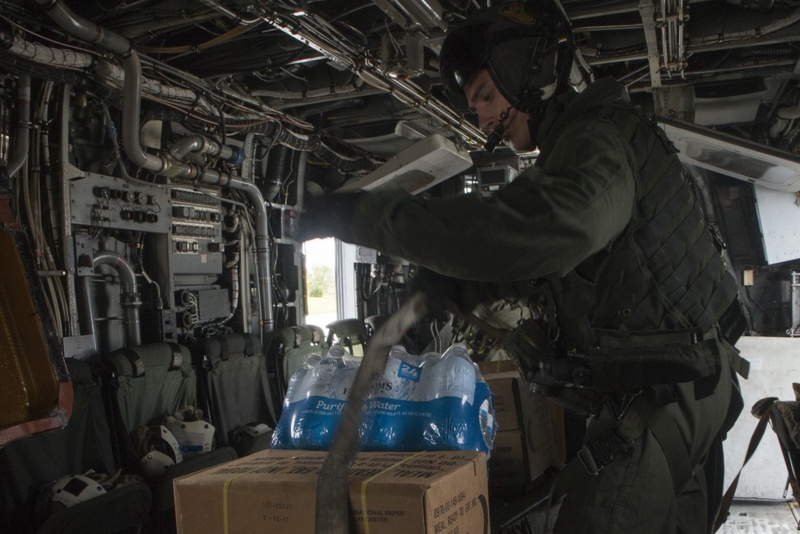 The Wasp ESG and 31st MEU also delivered water and other disaster relief supplies to the islands. 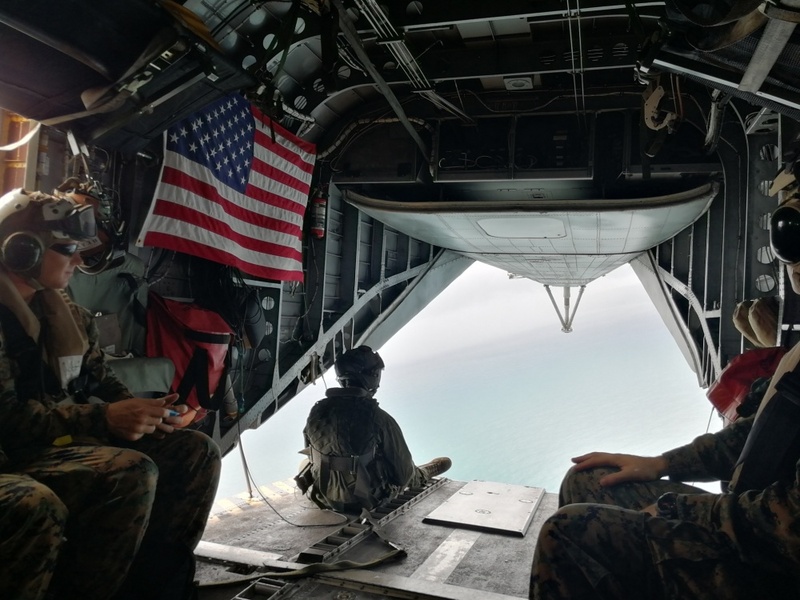 CH-53E Super Stallion crew members secure food and water aboard a helicopter with Marine Medium Tiltrotor Squadron 262 as part of Typhoon Mangkhut relief efforts. Navy photo. A year ago, USS Wasp (LHD-1) was in the U.S. Virgin Islands providing similar disaster assistance in the wake of Hurricane Irma. Wasp was in the process of moving to its new homeport in Sasebo, Japan, where it would serve as the forward-deployed big-deck amphib in U.S. 7th Fleet, when it was called upon to spend about two months participating in a massive disaster relief effort in the Caribbean Sea. Wasp had been homeported at Naval Station Norfolk and was moved to Japan to relieve USS Bonhomme Richard (LHD-6), which is now in San Diego undergoing a year-long maintenance and upgrade period. From Guam, the U.S. Coast Guard is also sending teams to assess damage to harbors, clear debris from the port and verify aids to navigation are operating at the islands.